We can define the position of a celestial body in relation to its local hour angle and declination. We can also state its position in relation to our own celestial meridian and celestial horizon; in other words, in terms of its azimuth and altitude from our position. The Azimuth is similar to the bearing in that it is the angle between the observer’s meridian and the direction of the celestial body. However, whereas bearings are measured clockwise from north from 000 to 360 degrees. azimuth is measured from 000 to 180 dergrees from either north or south. If the observer is in the northern hemisphere, the azimuth is measured from north and if in the southern hemisphere, it is measured from south. O is the position of an observer on the Earth’s surface and NOS represents the observer’s meridian. X is the position of a celestial body and in terms of bearing, the direction of X from point O is 045 degrees. 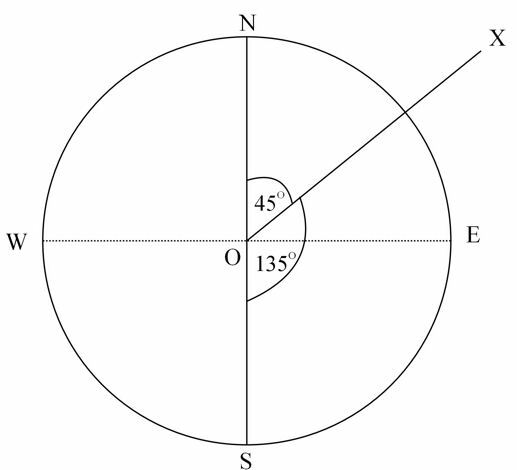 In terms of azimuth it is either N45E for an observer is in the northern hemisphere or S135E for an observer in the southern hemisphere. The altitude is the angle between the celestial horizon and the direction of the celestial body. 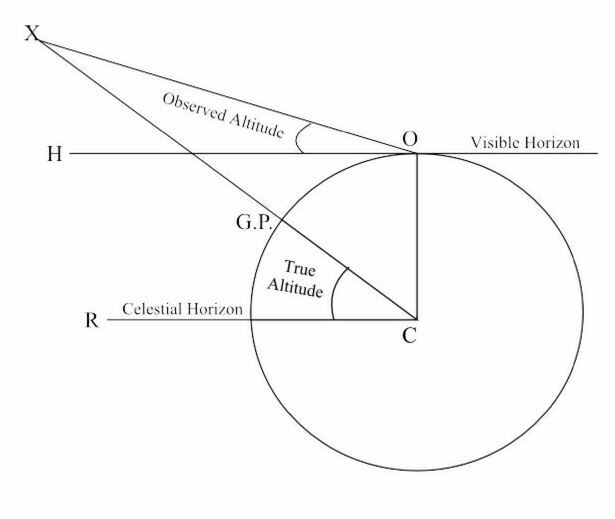 (The celestial horizon is the projection of the observer’s horizon onto the celestial sphere). As shown in the next diagram, the observer measures the altitude in relation to the visible horizon from his position at O on the Earth’s surface. So, the observed altitude is the angle HOX. However, the true altitude is measured from the Earth’s centre in relation to the celestial horizon and is the angle RCX. Point O will be approximately 6367 Km. from the centre of the Earth and so it would seem that the visible horizon is bound to be slightly offset from the celestial horizon. Because of the vast distances of the stars and the planets from the Earth, we can assume that, in their cases, the celestial horizon and the visible horizon correspond with very little error. However, in the cases of the Sun and the Moon, which are relatively near, a correction called Parallax must be added. The subject of Parallax error and other corrections will be dealt with in in another post. The next post in this series will explain the place of azimuth and altitude in the theory of astro navigation. It is possible only to give a brief outline of this topic here but an in-depth treatment is given in my book Astro Navigation Demystified. This entry was posted in Uncategorized and tagged astro navigation, astronomy, celestial navigation, navigation. Bookmark the permalink.